Invite friends to join you in your favourite PS4 games – even if they don’t own the game. Play your favourite games together*1 with your PSN friends wherever they are in the world*2 whether they own a copy of the game*3 or not. Share Play lets any friend who owns a PS4 console join you on a virtual sofa. Let them watch you play your favourite titles or experience the action for themselves, or jump into a local multiplayer game and play together – all with a press of the SHARE button. Want to let a friend try out your new game? Or give you a helping hand on that tricky end of level boss? Share Play lets you hand over control of your games to your PSN friends, no matter where they are*2. You could even pass control back and forth to finish an adventure together – just like playing together in the same room. You need to be a PlayStation Plus member to hand over control – but the friend playing doesn’t. Settle your rivalries by going head-to-head in local multiplayer games like FIFA15, or work together to take Sackboy and his new buddies on an adventure in LittleBigPlanet 3 – with Share Play, your PSN friends can take a second controller and join you in your games. To play games together, both you and your friend need to be PlayStation Plus members. Check out our step-by-step guide to all the ways you can share your games with Share Play. You can share your games with anyone on your PSN friends list*2, as long as you’ve both updated to system software 2.0 or higher – your friend doesn’t even need to own the game. As a guide, we recommend at least 2Mbps upload speed, while 5Mbps will give the best performance; your network provider can confirm your upload speed if you’re not sure. You should also limit the use of other network-connected devices – like smartphones, tablets and computers – while using Share Play. For any questions you may have on Share Play, check our FAQ page for more information. *1 Friends must have a PlayStation®Plus membership to join a “play a game together” session. *2 Shared games must be available on PlayStation®Store in both the host’s and friend’s countries for Share Play to be used. German users can use Share Play only with other German Sony Entertainment Network account holders. *3 Share Play allows unlimited 60 minute sessions. A host may only invite one friend per session. Shared games must be available on PlayStation®Store in both the host’s and friend’s countries for Share Play to be used. German users can use Share Play only with other German Sony Entertainment Network account holders. Games must be multiplayer. Games using PlayStation®Camera not supported. Any trophies earned by friends are not retained. Hosts must have a PlayStation®Plus membership. Friends must have a PlayStation®Plus membership to join a “play a game together” session. PlayStation®4 system and Sony Entertainment Network account required. 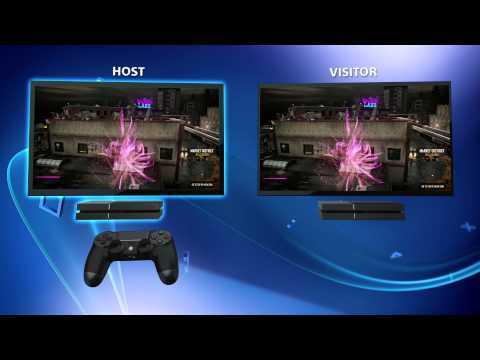 Both host and friend must be PSN Friends and online at the same time. If the Parental Control Level of the host’s game does not match the friend’s Parental Control Level setting, or if the friend’s age is lower than the game’s age rating on PlayStation®Store, Share Play cannot be used. German friends are required to input their German ID number if the game is rated 16+.